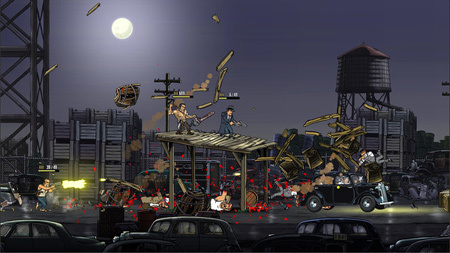 Guns, Gore and Cannoli 2 is an amazing action platform game by Crazy Monkey Studios and Claeysbrothers. It revives the good, old, action platform run and gun genre, but this time with a bunch of humor and buckets of blown off body parts. In this sequel to Guns, Gore & Cannoli, Vinnie Cannoli’s story continues and this time it’s personal. Prepare yourself to go to war after you make a shocking discovery about what actually happened during the end-stage of the Thugtown Massacre from Guns, Gore & Cannoli 1. Vinnie has received a massive upgrade in his mobility features. 360 aiming, double jumping, kicking, jump-kicking, dodge rolls, somersaults, dual guns and a weapon wheel. If you get stuck in the game, check out the video walkthrough and gameplay for the game. This entry was posted in PC Games, Walkthrough and tagged Guns Gore and Cannoli 2 Cheats, Guns Gore and Cannoli 2 Ending, Guns Gore and Cannoli 2 Gameplay, Guns Gore and Cannoli 2 Guide, Guns Gore and Cannoli 2 Hints, Guns Gore and Cannoli 2 Review, Guns Gore and Cannoli 2 Solutions, Guns Gore and Cannoli 2 Strategy, Guns Gore and Cannoli 2 Tips, Guns Gore and Cannoli 2 Walkthrough by Marvin. Bookmark the permalink.